As energy prices continue to rise, Alaskan engineers and builders are pushing the envelope in the quest to build ever-more energy-efficient housing. Some of those innovations are making their way into residential construction, as builders look to meet homebuyers’ demand. 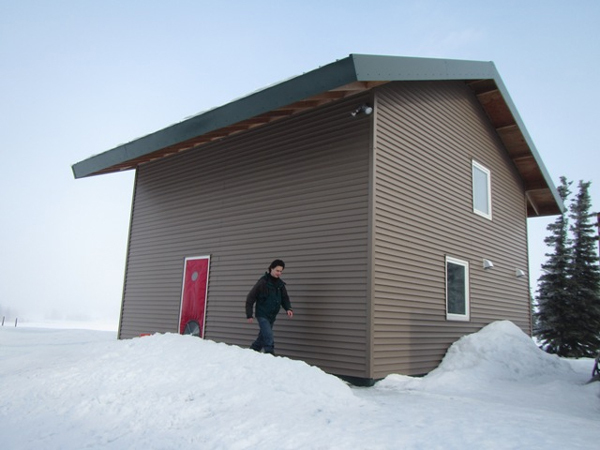 UAF professor Tom Marsik has built what he says is the world’s most efficient house, a small, airtight structure that he and some friends built in Dillingham a couple of years ago. “It’s extremely insulated – we’re talking 28-inch thick walls, just to put it in perspective,” Marsik said. Those thick walls are rated at R-90, nearly four times more than the required R-21 for walls; and the ceiling’s R-140 rating is nearly triple the required R-49. Marsik, who teaches sustainable energy, says on most days he can warm his small, airtight home with about the same amount of energy it takes to run a hair-dryer. 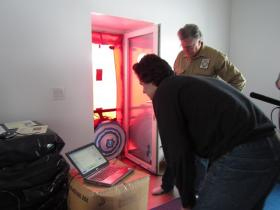 “Last year, it cost us about one-hundred-fifty dollars to heat the home for the entire year,” he said. Marsik says he was inspired to build the house after spending a few winters here in Fairbanks teaching at the main UAF campus. Cold Climate Housing Research Center President and CEO Jack Hebert marvels at the work of Marsik and others he calls “pioneers” of efficient homebuilding. He includes Thorsten Chlupp, a Fairbanks-area builder who like Marsik has constructed highly efficient homes that are super-insulated and that also often employ sustainable-energy heating systems. “There’s amazing things done in Alaska by very creative people – like Tom, like Thorsten, like others in the state who’ve always been pioneers in housing,” he said. But Hebert says not all the advances developed by those pioneers in their quest for a home that requires little, if any additional energy to heat, will make their way into mainstream homebuilding. Because some are too expensive or unappealing to homebuyers. That’s the challenge that green homebuilders like Aaron Welterlen confront. Welterlen’s Fairbanks-based company, WV Builders, touts its line of energy-efficient and affordable homes. He says most of his customers tend to be first-time homebuyers, often young families or people temporarily here, like military personnel or contractors. Welterlen says homebuyers in the Interior have increasingly shown a preference for energy-efficient homes in recent years since, not coincidentally, the price of heating oil began its rise to $4 a gallon. But he says he must weigh how many of those features a prospective homebuyer is willing to pay for. Because such features as super-insulated windows and ground-source heat pumps – which extract heat from underground – all add to the upfront cost. Welterlen says despite such incentives as rebates of up to ten-thousand dollars offered by the Alaska Housing Finance Corporation, and the payback that energy-efficient features promise, many homeowners still just can’t get past the sticker shock of, for example, a twenty-thousand-dollar ground-source heat pump. Hebert says that shows that shows a demand for energy-efficient homes – but, for many, it’s a demand that has limits, based on cost. Hebert and Welterlen both say that’s already happened, as shown by homebuyers’ sustained interest in energy efficiency. Hebert says building on that progress won’t be easy, and will require educating homeowners by getting the word out about breakthroughs in efficiency and introducing them into the marketplace, then making the case on investing more now to reap the energy savings later.